We’ve got a jumbo episode of Star Wars Story Talk (AKA the show formerly known as Unboxing Star Wars) as Yowie the Skunk, Baby Jawa, and I cover a whole sandcrawler-load of the latest in Star Wars stories. 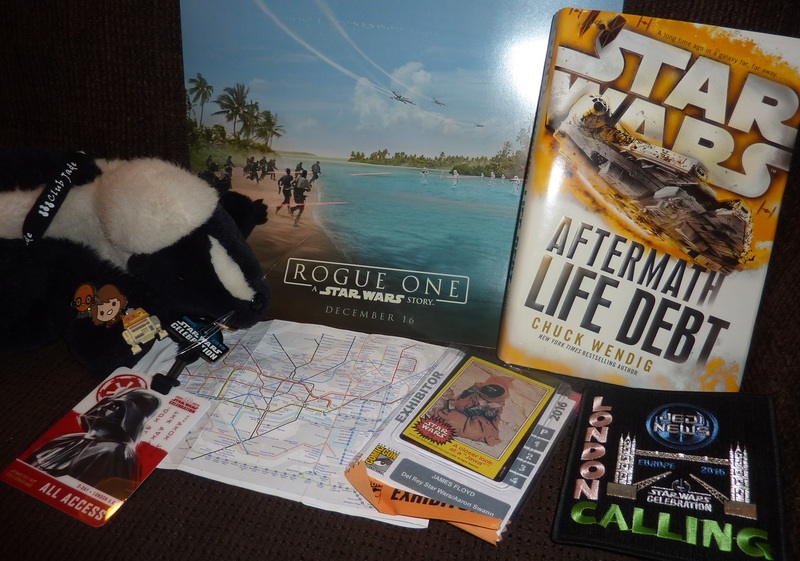 Baby Jawa does her first reaction video, watching the Rogue One trailer, and Yowie and I talk a bit about Star Wars Celebration Europe, San Diego Comic-Con and review Aftermath: Life Debt, the new novel by Chuck Wendig! Plus a little update on Wear Star Wars Every Day, a visit from a Loth-cat, and of course some Baby Jawa fun time! → Trailer for Rogue One: A Star Wars Story – I am really excited for this movie and this trailer just pushes it up another notch. But how will Baby Jawa react to her first movie trailer viewing? → Star Wars Celebration Europe – Big thumbs up! A whole ton of fun and a lot of work. Plus seeing old friends and making new ones while in London! → Star Wars at San Diego Comic-Con – Even though there wasn’t a big movie panel, Star Wars still brought a lot to San Diego, including the Rogue One costume display and the publishing panel. → Star Wars: Aftermath – Life Debt – Chuck Wendig increases the scale and brings in some favorite film characters into the post-ROTJ era as the heroes help track down Han Solo as he’s disappeared while trying to liberate Kashyyyk. Solid read! → Loth-Cat Plush from Star Wars Celebration Europe – A big hit! Mrowwwl! Help me come up with a name for this grinning feline! On StarWars.com: Recent interviews with Chuck Wendig on Aftermath: Life Debt from Del Rey and Jarrett J. Krosoczka on Jedi Academy: A New Class from Scholastic. Podcasts: Thanks to Coffee with Kenobi for having me on the podcast as a featured guest to talk Bloodline, Life Debt, and Wear Star Wars Every Day, and thanks to Skywalking through Neverland for bringing me on the show to discuss Wear Star Wars Every Day. Salt Lake Comic Con: Check out my schedule at Salt Lake Comic Con (Sept 1 to Sept 3) or just view the general Star Wars-related programming, featuring Mark Hamill, Jeremy Bulloch, Lucasfilm Story Group members: Pablo Hidalgo, Leland Chee, and Matt Martin; also including Star Wars authors, artists, and voice actors, and the Full of Sith podcast crew: Bryan Young, Amy Ratcliffe, and Mike Pilot. Note: Del Rey provided a copy of Life Debt: Aftermath (Star Wars) for review.